Better Nature is Californian quartet Silversun Pickups’ fourth album, the follow-up to 2012’s superb Neck of the Woods. They’ve always written brilliant dreamy shoegaze songs with a hint of danger, but never managed to receive much attention in New Zealand. New World supermarkets started to use ‘Lazy Eye’ in their advertisements a few years ago, but I still see Silversun Pickups as an underrated indie secret. Better Nature is more energetic than the previous albums, hinting that it may prove to be the break through album in New Zealand. The titular opening track ‘Cradle (Better Nature)’ is more explosive than I had expected from the band based on their earlier output. I realised something different was up at the songs halfway point, when the choral chant of “Better! Nature!” launches into a raunchy guitar solo. The previously shy shoegaze sound has turned frantic and demands the listener’s attention, while still retaining the attractive fuzziness. Second song ‘Connection’ follows up just as strong. 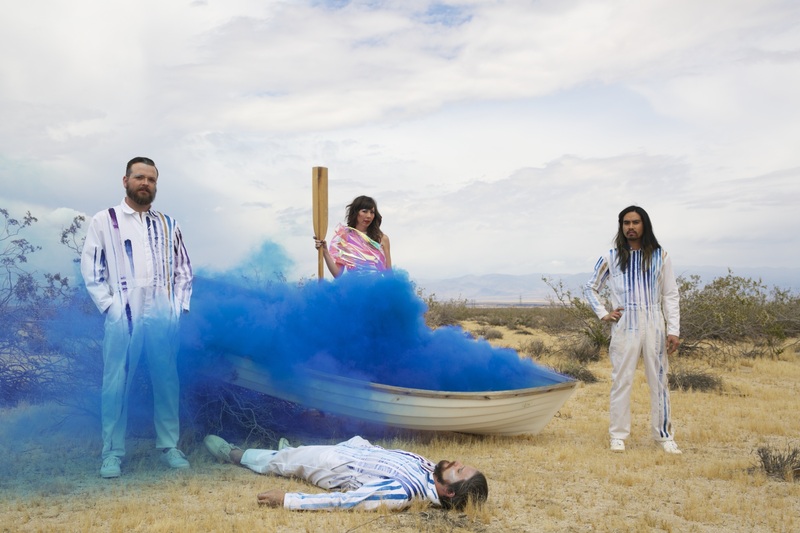 It’s the same Silversun Pickups sounds that you know – crisp drums, throbbing bass, ethereal fuzzy guitar and atmospheric synths. But this time it’s a case of more. More variety, more attitude, more wild and unkempt. Frontman Brian Aubert even looks more wild. Watch the video of their last video clip (Cannibal) and compare his appearance to the ‘Nightlight’ video and you’ll see what I mean. Better Nature features loads of interesting sounds and tones, lurking almost into industrial territory at times. For example, ‘Friendly Fires’ reminds me of soundtrack work that the album’s mixer Alan Moulder has done alongside Nine Inch Nail’s Trent Reznor in the past. It begins with threatening throbbing bass that evokes a tense thriller scene, before the introduction of chirpy keys reminiscent of Jay Z’s “New York State of Mind”. The cut out chorus sung a capella over hand claps adds to the eerie feel..
Lead single ‘Nightlight’ also has a lot of similar elements to Nine Inch Nail’s ‘Hand That Feeds’. It’s not as upbeat, but the distinctive drumming, moody bass, and victorious chorus make it a perfect synth pop anthem. It’s impressive that the band can keep their familiar signature sound and still write songs that sound different. You can tell that they’ve made an effort to prevent the songs all sounding the same. Many start strong and unique, before slowly reverting back to the usual fuzzy sound. And there are so many strange outros that don’t match their respective songs. Clinky slow xylophones, a child singing, and odd vocals all feature in outros that seem out of place, in attempt to mix things up. ‘Pins & Needles’ is my personal favourite, featuring a groovy swagger thanks to slide guitar before returning to the familiar infectious fuzzy sound. The guitar solo is a ripper too, with some delicious tones. ‘Tapedeck’ has lovely resonating marimba or vibraphone playing over a dancy syncopated beat and dripping with odd sounds that allude to industrial music. The expansive slow chorus sounds odd juxtaposed against the driven verses, but it works. Bassist Nikki Monninger takes over lead vocal duties in the echoed chorus of ‘Circadian Rhythm (Last Dance)’ and her voice is so good it’s a wonder that she didn’t feature more prominently throughout the album. Better Nature is great – both recognisable and fresh. It’s more dangerous and wild than the previous albums, with the same brilliant aspects that made them so good. It’s not as dreamy anymore, but the dark new urgency makes for more exciting music.